We commenced performing prostatesparing radical cystectomy in selected patients since 1992, in order to improve the functional results while maintaining similar oncological control as compared to radical cystoprostatectomy. Radical cystectomy is currently the treatment of choice for invasive bladder cancer and recurrent refractory cases of superficial transitional cell carcinoma (1). However, the procedure influences significantly the quality of life of these patients, especially their sexual and urinary functions. Although current oncological treatments tend to balance the benefits associated with a radical surgery and bladder preservation modalities such as chemotherapy and external beam radiation, cancer control is still inadequate compared to the surgical results (2). 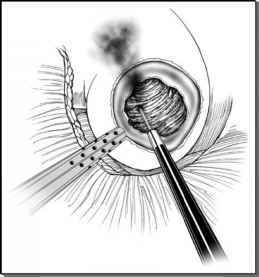 With the above concept, partial cystectomy has been described in many centers. However, there is an increased danger of local recurrence and the development of synchronous prostate cancer (3). We commenced performing prostate-sparing radical cystectomy in selected patients since 1992, in order to improve the functional results while maintaining similar oncological control as compared to radical cystoprostatectomy (4). The open prostate-sparing cystectomy technique has been modified and used by other teams as well (5-7). Benefiting from experience gained after performing regularly laparoscopic radical prostatectomy, we have developed a laparoscopic approach for this procedure and have done over 30 cases with satisfactory clinical and functional results (8). Laparoscopic prostate-sparing radical cystectomy should be reserved for very selected patients that meet not only the regular preoperative criteria, but most importantly strict clinical and laboratory criteria. Because of the oncologic risks associated with any surgical technique, especially if it involves a functional and organ-sparing technique, as well as an associated potential higher risk, it cannot be overemphasized that nerve and prostate-sparing cystectomy is not indicated in every patient with invasive bladder cancer requiring a cystectomy. Laparoscopic prostate-sparing radical cystectomy should be reserved for very selected patients that meet not only the regular preoperative criteria, but most importantly strict clinical and laboratory criteria (9). Because of the oncologic risks associated with performing a prostate-sparing technique, candidates must not suffer any form of erectile dysfunction and must be completely continent; otherwise this procedure offers no benefit. Concerning the surgical technique, patients should have a complete medical history with physical exam, including digital rectal exam and recent cystoscopy. The laboratory panel must include renal function exams and prostate specific antigen and percentage free prostate specific antigen. Finally, the imaging studies must include a computerized tomography and if possible an intravenous urography. Patients with an abnormal digital exam or a prostate specific antigen over 3 ng/mL, or a low percent free prostate specific antigen (<12%) or hypoechoic area on transrectal ultrasound, must undergo a series of prostatic biopsies to exclude prostate cancer. Finally and most importantly, the bladder tumor characteristics should be strict; such as not being located in or within 10 mm the bladder neck, nor in the prostatic urethra. The histology of the bladder cancer should be transitional cell carcinoma and it must comply with the regular indications for a radical cystectomy and a continent diversion (Table 1). The best indications for a prostate-sparing cystectomy are: a potent and continent patient with no contraindications for laparoscopic procedures, with a pTa, pT1 or pT2 bladder tumor that is located far from the bladder neck, with no risk of prostate cancer and no urethral carcinoma-in-situ. Concerning the laparoscopic approach, regular preoperative evaluation, involves excluding absolute anesthetic contraindications for laparoscopic procedures, which also applies to this procedure: intracranial surgical history, brain aneurysm or previous intracranial tumors. There are also some relative anesthetic contraindications that involve respiratory insufficiency such as severe emphysema, severe cardiac insufficiency, and glaucoma. Finally, there are certain patients that will make the procedure more difficult and could be considered, depending on the surgeons experience as relative surgical contraindications, these include: morbid obesity, previous pelvic or abdomen radiotherapy, and history multiple abdominal surgeries. The best indications for a prostatesparing cystectomy are: a potent and continent patient with no contraindications for laparoscopic procedures, with a pTa, pT1 or pT2 bladder tumor that is located far from the bladder neck, with no risk of prostate cancer and no urethral CIS. Our routine preoperative preparation includes antithrombotic prophylaxis with low-molecular-weight heparin, which is administered subcutaneously the night before surgery and elastic stockings the morning of the surgery. Antibiotic prophylaxis is started during the induction of anaesthesia, and consists of Cefotetan 2 g intravenously. There is no need of bowel preparation before surgery; however, a low residue diet can be recommended five days before surgery. Concerning the skin, the patient's abdomen is not routinely shaved and the patient takes a bath the morning of the surgery with Betadine®. The surgery is performed under general anesthesia following all the classical anesthesiologic principles. During the induction, Propofol™ (2 mg/kg) is used and transoperative maintenance is done with Desflurane™ or Sevoflorane™ gas, and muscle relaxation by curarization with Atracurium™ (0.5 mg/kg) during the induction and maintained at 0.3mg/kg/hr. Finally, perioperative analgesia is provided with Sufentanil™. One important aspect of surgery is patient positioning to avoid the risks associated with a prolonged surgery. The position used is the decubitus position with the lower limbs; the arms strapped along the body so as not to obstruct the surgeon or assistant. Abundant cushioning should be placed to avoid pressure injuries and Velcro straps are applied across the shoulders to maintain the patient's position during the surgery and allow a 30° Trendelenburg tilt, which will be maintained throughout the surgery.